SCVHistory.com | People | Henry Clay Needham: A Different Vision for Newhall. Henry Clay Needham: A Different Vision for Newhall. Santa Clarita Valley Living Magazine | February 2006. One day soon, the Gate-King Industrial Park will transform the south side of Newhall into a vibrant economic engine for Santa Clarita. Located on 508 acres between Pine Street and Sierra Highway, the new business park will create 7,000 jobs and boost the city's inventory of television and film production facilities. Natural features of the land will be preserved, and fully half of the property will be deeded to the city of Santa Clarita as permanent open space. The business park is a partnership of three primary landowners: Longtime real-estate investor Hank Arklin; Eternal Valley Memorial Park; and Mark Gates, whose family has owned the bulk of the property since 1957, when Mark's father bought it for $1.1 million from a speculator who had just bought it from the heirs of Henry Clay Needham. The Needham name is largely forgotten in Santa Clarita today. But once upon a time, Henry Needham could have laid claim to the title of the valley's most prominent citizen, had he been so inclined. 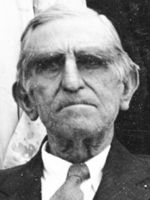 Henry Needham was a man with a vision of his own for Newhall. But unlike that of his successors more than a century later, Henry Needham's vision for the transformation of Newhall was not to be. When Needham rode into town in 1888, downtown Newhall was two blocks long. It sported no fewer than four saloons and little in the way of houses of worship — a situation that must have rankled Newhall's newest resident to no end, for this was one of the nation's most ardent prohibitionists. A native Kentuckian, Needham had written the "dry laws" that were enacted by his friend, John St. John, governor of Kansas from 1879 to 1883. St. John, along with George B. Katzenstein of Sacramento and James Yarnell of Los Angeles, went in together in 1887 to purchase 10,000 acres of sand and sagebrush from The Newhall Land and Farming Co. for the purpose of establishing a dry colony. Hired to supervise the establishment of this new St. John Subdivision, as it was called, was Henry Needham. Needham plotted out the subdivision, which was centered around today's Lyons Avenue at San Fernando Road and ran all the way north through the present Circle J tract to Soledad Canyon Road. Under the terms of the grant deeds, anyone caught in possession of the devil's brew on his property was subject to foreclosure. As might be imagined, there were few takers. But there were sympathizers. Needham wasn't alone in his mission. Alex Mentry, superintendent of the Pico Canyon oil field, located about three miles west-southwest of today's Stevenson Ranch, didn't allow liquor in his town of Mentryville. That's not to say the oil workers themselves didn't drink; they did. They rode into Newhall to imbibe at those four bars, which sported names such as the "Oil Exchange" and the "Derrick Saloon" in acknowledgment of the clientele. Needham eventually gave up on trying to sell land only to teetotalers, but not before trying to win over the heathens at the pulpit. A skilled orator, in 1891 he helped form the First Presbyterian Church at Newhall Avenue and Market Street on land donated by Henry Mayo Newhall's widow, Margaret Jane White. Around this time he also built a meeting house on Pine Street for the International Lodge of Good Templars, a prominent temperance society. Today the structure sits in Heritage Junction Historic Park in Newhall, where it is known as the Pardee House. By this time, Needham had ensconced his wife, Lillie F. Taylor of Kansas, and the first of their five children in a ranch home he built on more than a square mile of land he had accumulated for himself — the area now slated for the Gate-King Industrial Park. The two eldest children, Nellie and Pearl, attended Newhall School. When the school burned down in 1890, Needham helped pay for a new one at Newhall Avenue and 9th Street, a block from the location of the church that came a year later. When the eldest girls reached high school age, Needham moved the family to Los Angeles. He spent much of time on the road, preaching the prohibitionist message and seeking several elective positions on the Prohibition Party ticket, including President of the United States — although he never made it past the party primary for that office. The Needhams would continue to divide their time between their cultured Los Angeles home and "the ranch" out here in cow country. The family patriarch eventually developed part of the Happy Valley tract and dabbled in oil, although never very successfully. After the turn of the 20th Century, Needham acquired the Newhall Water Co., a restaurant and, with the advent of the automobile, one of the area's first filling stations. Granddaughter Marjorie Segerstrom Coffill remembers the Needham ranch house. "The entire upper floor of the ranch house was the sleeping quarters, a large loft partitioned by curtains for privacy. I was always a bit frightened sleeping there," she wrote, "although the beds were big and comfortable with clean sheets and wonderful quilts. But even a well-ventilated second floor got very hot in the summer months. "For many years there was a privy in the back yard, a root cellar, and a cold cellar. ... Running water came only to the kitchen and to a wash basin. Cooking was done on a wood stove, and illumination was provided by kerosene lamps. No electricity reached the house until the early 1930s." Coffill said her grandfather had a yen for wildlife. "There was always a big washtub full of clean, cool water for the deer and coyotes," she wrote. "His tree squirrels were a joy not only to him but also to his guests. He had placed pipes between some of the large oaks so that the squirrels could run from tree to tree without touching ground. Each morning Daddy Mo (her nickname for Needham) would go out with a big bag of nuts and an old hammer. He would sit in a battered chair, a high round chunk of wood before him. 'Here, squirrely, squirrely, here squirrely,' he would call, and the squirrels would come from everywhere. ... He knew them all and the feeding didn't end until every squirrel had his treat." When the Newhall Ice truck would make deliveries, everyone would make sure Needham didn't notice that it also advertised "COLD BEER" on one side, Coffill remembered. Needham built a Kentucky log cabin on the ranch property in 1932. Both the ranch house and the cabin burned down in one of the big fires of the 1960s that consumed vast portions of the Santa Clarita Valley — including Gene Autry's Melody Ranch in nearby Placerita Canyon 1962. "Daddy Mo was, to the end, a prohibitionist," Coffill writes. "If he saw a drunken man on the streets of Newhall, he would go to the Sheriff's office and swear out a warrant for his arrest. After the man was put in jail, Daddy Mo would go talk to him about the evils of drink. He would then pay his fine and take him home." Needham died in 1936, aged 85 years. His heirs sold their 770-acre ranch property in the 1950s to Mark Gates Sr., the funeral director at Eternal Valley Cemetery. Gates eventually sold the 220-acre cemetery portion — some of which is now coming back together as the Gate-King Industrial Park under Mark Gates Jr. The Needham Ranch property will indeed be spurring a transformation in Newhall, although nothing like the one its early owner envisioned. And yet, his legacy remains. If you pull a title report on property in certain parts of Newhall or the Circle J development, you'll still find the name, "St. John Subdivision," to remind you what might have been, if only the first residents of Newhall hadn't been so darned thirsty. ©2006 Leon Worden | All rights reserved.